Ambrosia artemisiifolia ragweed. MBGargiullo. Falmouth, MA.8.2015 (Accessed 10/2016). Ambrosia artemisiifolia is an annual herb, 30-100 cm tall, from a taproot; the mycorrhizal fungus Opidium brassicae has been reported from the roots (Bassett and Crompton 1975); plant branching above, usually hairy. Ambrosia artemisiifolia leaves. jardin Périgueux_(5). commons.wikimedia.org (Accessed 8/2017). 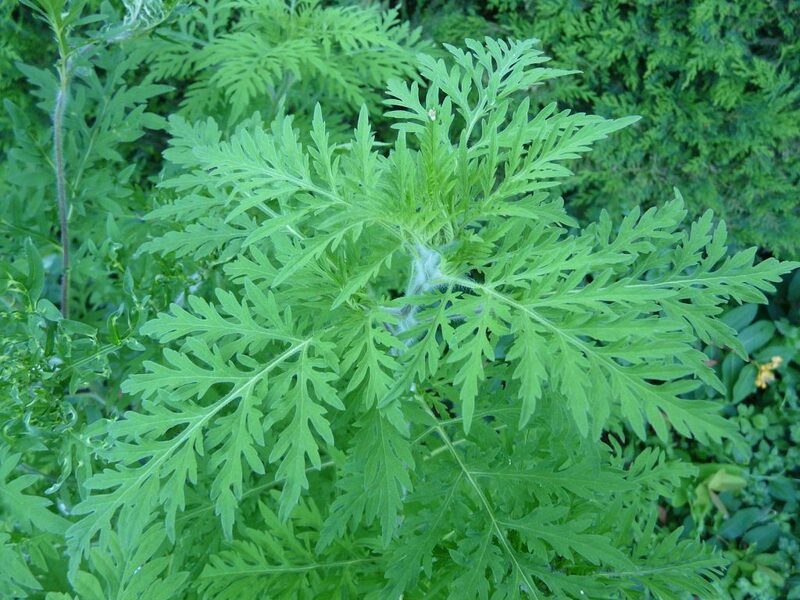 Leaves opposite below, alternate above, once or twice pinnately divided, 4-10 cm long. 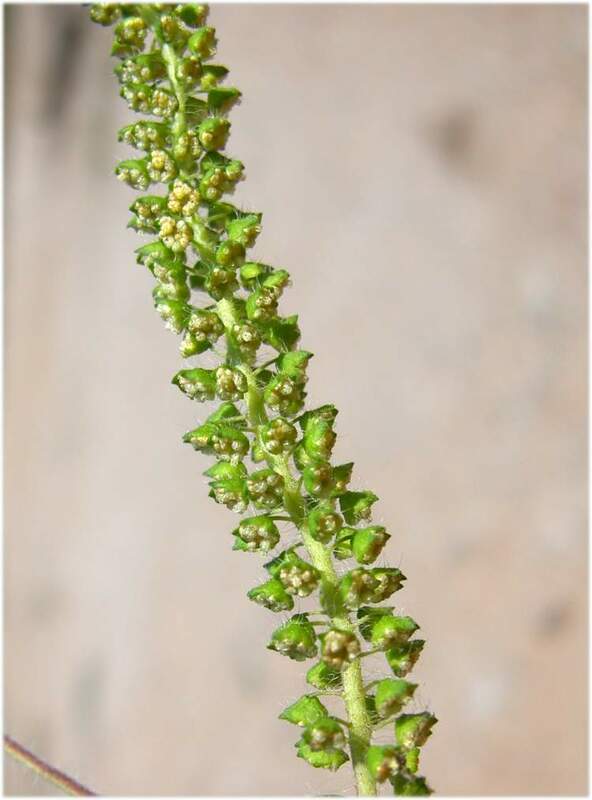 Flowers green, in small heads subtended by bracts, minute, radially symmetrical; flower heads are either female, with a single flower per head, or male, with up to 100 flowers in each head; inflorescence of thin racemes; blooms Aug.-Oct., wind pollinated, pollen allergenic; abundant. Ambrosia artemisiifolia. fruit. 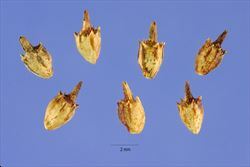 close-up of seeds (Photo- Steve Hurst at USDA PLANTS Database. keyserver.lucidcentral.org (Accessed 8/2017). Habitat: Open areas on bare soil, disturbed roadsides, abandoned fields, curbs, fill, garden weed; prefers soil pH 6.0-7.0 (Bassett and Crompton 1975). Notes: Fruit persist on plants into winter, generally falling close to parent plant; germinates the following spring; eaten by numerous birds and small mammals, plants eaten by rabbits (Martin et al. 1951). 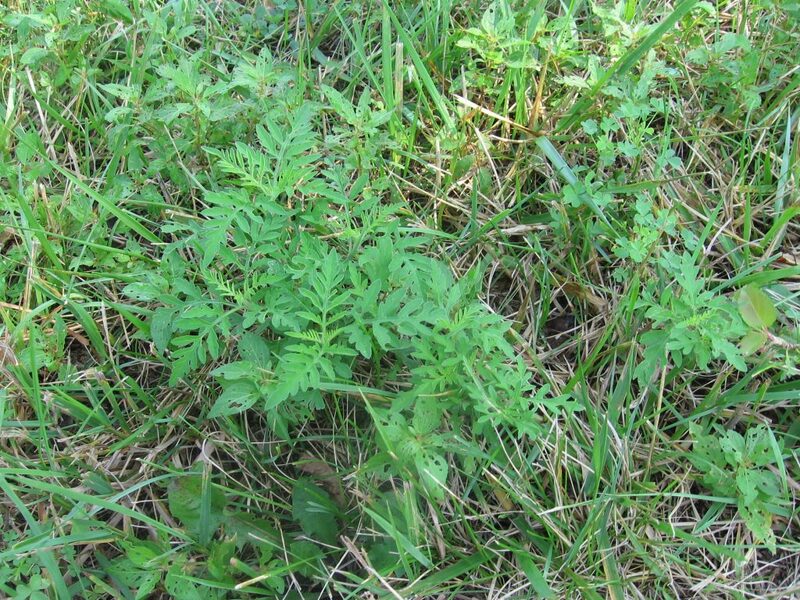 An early successional spring annual, seeds germinate in March, April or May, those that do not germinate early become dormant once again and must undergo an extended period of cold (overwinter) before they can germinate; can remain viable in the soil for more than 39 years (Keever 1979). Outcompeted by winter annuals (Raynal and Bazzaz 1975). 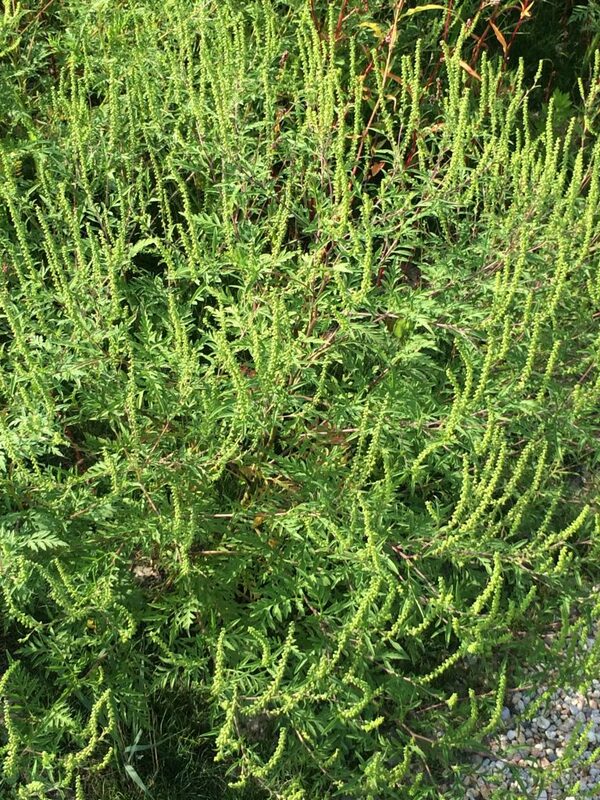 generally replaced by perennial herbs within two or three years of initial disturbance. Pollen has been found in deposits older than 60,000 years from between glacial periods in eastern Canada. An increase in pollen deposits during the last 200 years coincides with forest clearing following European settlement (Bassett and Crompton 1975). Attacked by a number of fungi including; Erysiphe cicharaceum, Albugo tragopogonis, Entyloma compositorum and E. polysporum. Also attacked by the Aster yellow virus and parasitized by the dodder Cuscuta gronovii (a flowering plant) (Bassett and Crompton 1975). Ambrosia artemisiifolia. Male flowers.commons.wikimedia.org. (Accessed 4/2014).